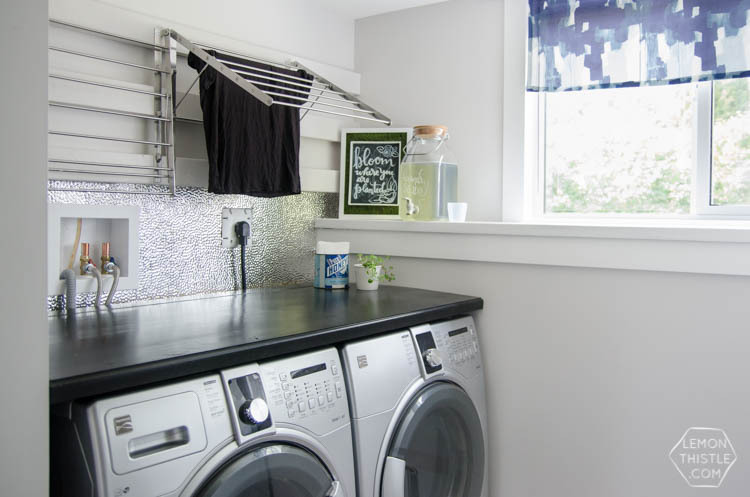 Most laundry rooms are pretty utilitarian spaces. Sometimes they are no more than closets, with sliding doors to hide the washer and dryer (and a multitude of other sins!). 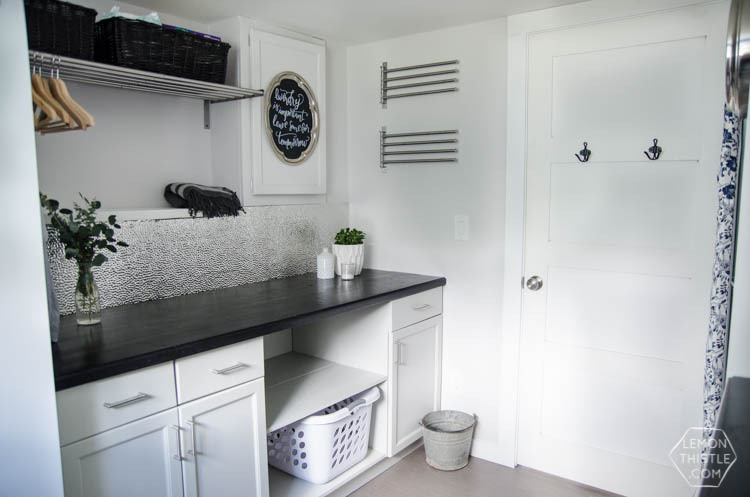 At other times they are combination mudrooms/laundry facilities, and sometimes they are nothing more than shared space in a finished or unfinished basement. Colleen over at lemonthistle.com is a highly creative do-it-yourselfer. She and her husband took on a massive renovation of the house they bought: a project which included a full kitchen remodel, removal of an awkwardly placed door, tearing out walls, refinishing floors and creating a living suite in half of their unfinished basement. Colleen has documented all these projects on her blog, with wonderful before and after pictures as well as detailed tutorials. What is downright astounding is that Colleen and her hubby managed to transform their laundry area so amazingly at a very reasonable cost. They accomplished this by recycling some of the elements, thrifty purchases and utilizing Colleen’s crafting talents. Colleen was limited in where she could place the washer and dryer, massive re-plumbing was not in the budget. 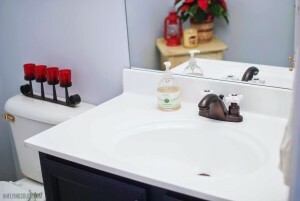 A much desired laundry sink had to be foregone for the same reason; the plumbing do-over that would have been necessary was cost prohibitive. Colleen concentrated instead on working with what options she had. She was able to re-purpose some cabinetry from her father’s kitchen remodel; separating two cabinets, with some DIY shelving between, created ample space for laundry baskets and supplies. 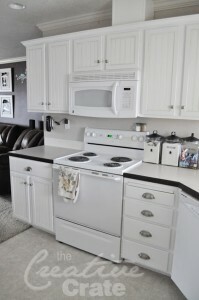 She repainted the cabinets herself using a durable paint finish that is designed specifically for cabinetry. With small kids in the house the surface had to be tough, able to withstand repeated abuse and frequent cleaning. 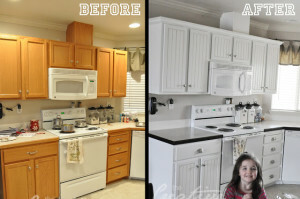 Colleen was so impressed with the results that she plans on using the paint not only on other cabinets but furniture as well. Another bit of DIY genius in this laundry room renovation is the countertops. 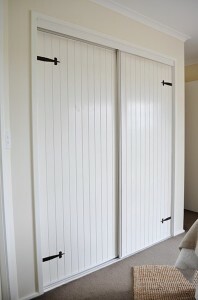 Collen and her husband put them together from 2x6s laminated together with wood glue. 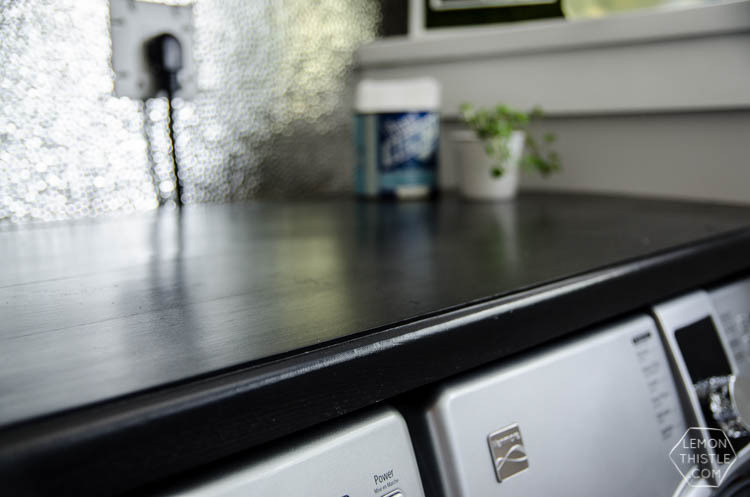 She stained the finished counters ebony which provides a striking contrast to the rest of the room which is painted in shades of grey. The countertops grace the top of the washer and dryer as well as the cabinet and shelving combination opposite providing plenty of laundry sorting and folding space. 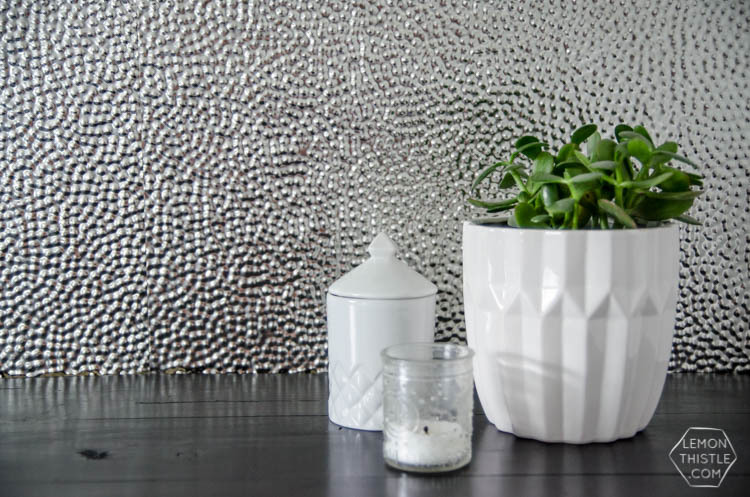 Another inspiration was a pebbled steel backsplash constructed from ceiling tiles. An unusual choice to be sure, but one that really elevates this renovation right into the stratosphere. The pebbled steel surface is semi-reflective which optimizes the available light in the room. Get more backsplash ideas here. Colleen was able to score additional decorative design elements inexpensively and creatively. 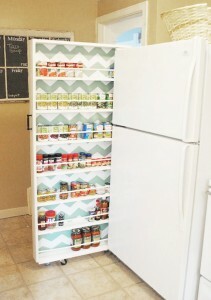 These include: a great designer wall clock which cost all of $2 on eBay; laundry detergent containers made from glass drink dispensers hand labelled with chalk paint markers; dryer sheets storage in a vintage tin; an old milk re-purposed as a small wastebasket, to name just a few. Check out her blog post for additional links to tutorials that detail her process for backsplashes, vinyl floor tiles and more!